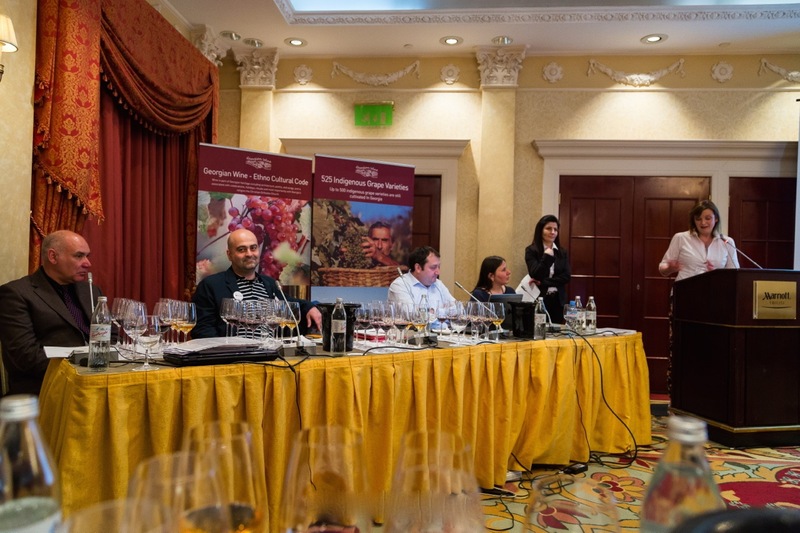 Under the tutorship of Sarah Abbott MW, and Shalva Khetsuriani this well attended tasting was a brilliant introduction to the great variety of grape varieties and wine styles of Georgia, the “cradle of wine”. Wines in Georgia are made either in the classic way using stainless steel tanks, or in the 6.000 years’ old traditional method of using stoneware pots buried in the earth, called qvevris. Among the many white grapes, Rkatsikeli and Mtsvane are Georgia’s best known varieties. Their wines are produced unblended or blended, in the latter case in a proportion of 80 and 20% respectively. Although the Rkatsiveli grape can produce 100% varietal wines of great elegance and balanced acidity, Mtsvane with its more neutral and mineral character is often added to give complexity to Rkatsikeli’s slightly aromatic and sometimes one-dimensional appearance. Tsinandali’s 2010 blend had a perfect balance of all components, with elegant fruit tannins at its long finish. This wine at its optimum stage of development demonstrated that these white grapes need about 2 years bottle age to reach their optimum. Alaverdi Monastery Cellar’s qvevri version of the 2011 Rkatsiteli impressed by its complex aromas and almost spiciness, and by its dry and long finish. Khareba’s 2011 Krakhuna was a white wine of a light and easy drinking style. However, Mandili’s 2012 qvevri Mtsvane did not impress: the 6 months of fermentation and additional one year of ageing in qvevris gave the wine too much oxidation, the wine had bitter tones on its finish. The 2012 Chkhaveri made by the KWT winery from this rare white grape had interesting aromas, but was a bit short. Among the reds were four Saperavi wines, the leading grape in Georgia. Three of the wines were dry: Tbilvino’s 2010 Mukuzani aged in barrique, a well made wine with peppery aromas; and two excellent qvevri Saperavi wines, Vita Vinea’s 2011 Saperavi, and Marani’s single vineyard 2011 Saperavi which had 5 months qvevri and additional ageing in barrique. There was also an excellent semi sweet 2012 Saperavi from Kindzmarauli, of a DOC style and quality. Chateau Mukhrani offered its 2011 Shavkapito, a very rare variety, with good fruit and acidity on the finish. This wine was matured in barrique which was quite present on bouquet and palate. The tasting ended with a tasting of Chateau Mukhrani’s pleasant “Chacha”, distilled like grappa from the left-over of wine pressing. 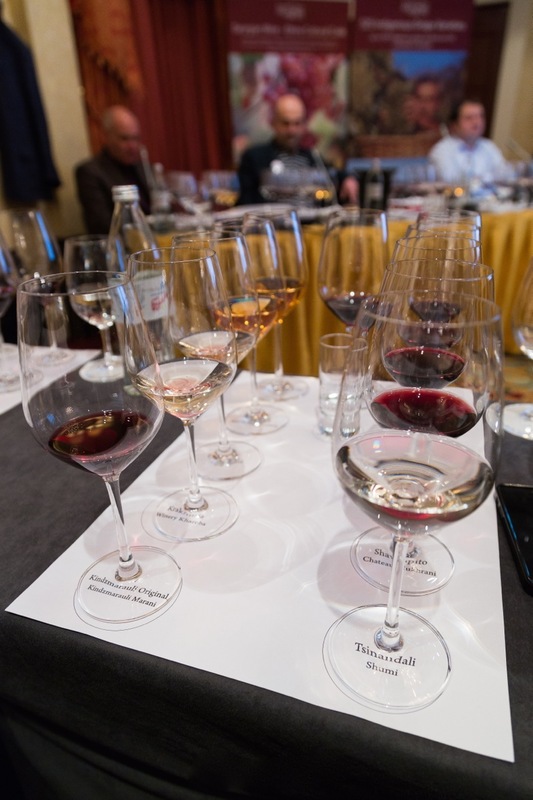 It should be noted that some of the best wine producers of Georgia were not represented at this tasting (happy to stay at home while an important wine tourism event happens in their own country!) which could give only an introduction to Georgia’s overall wine production. However, the participants of the Conference had at lunch an opportunity to taste the wine of probably the best producer of qvevri wines, the boutique winery “Pheasant’s Tears”. Jochen Erler, Circle of Wine Writers.